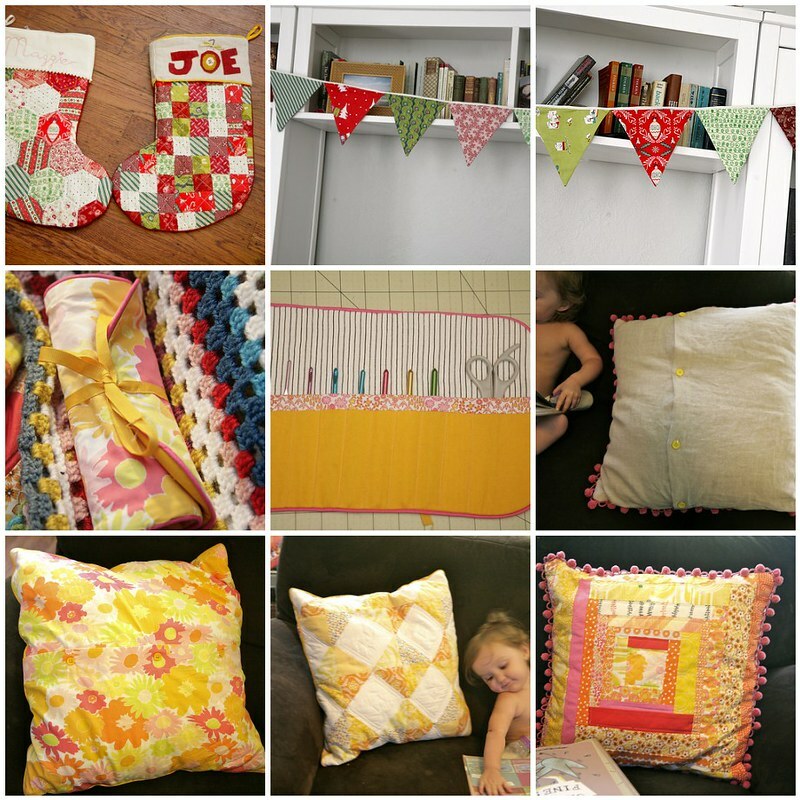 Inder Loves Folk Art: 2014 Recap: Sewing! Happy New Year, readers! I hope you had a wonderful holiday. We had a lovely Christmas, and my children made out like bandits (of course). And Joe lost his first tooth the other day! My baby boy is getting so grown up! And I got a fancy new car - this was not part of the plan (sadly, my last car, a Toyota Matrix, died an untimely death when its transmission went kaput after only 110k miles), and financially it's kind of a bummer. But ... but my new ride sure is purty! It's a white Toyota Camry Hybrid. My daily commute (48 miles round trip) adds up fast and it will be nice to buy gas less often. It might even be worth economizing a bit more on fabric and patterns. So it has been exciting times here. All in all, a positive start for 2015! I love reading everyone's year-end round-up posts, so of course I have to do my own as well, complete with mosaics! And a bit late as always. This year I am going to do two round-up posts: one for sewing stuff, the main focus of this blog, and one for house stuff, which has been a major focus for me this year and definitely feels like a big (maybe the biggest) accomplishment of 2014! Last year I made some sewing resolutions which I then naturally forgot all about. But looking at them now, I'd say I did pretty well. I did not learn to put in a zip fly, and I did not complete any major smocking projects (maybe this next year is the year! ), but I did sew a bunch for myself, and I did sew a lot of patterns from my stash. I think I did quite well with this in 2014. I made myself six t-shirts (two were never blogged and not included above), which I wear quite frequently (and I'm still wearing last year's t-shirts too). Of these, my Plantain t-shirts are easily the most frequently worn me-mades. The neckline and swingy fit really suit me. Love that pattern. I need more! My least favorite tee, not including muslins and practice versions, is my Breton Tee. I'm afraid that even with my modifications, the neckline is too high. It's not comfortable. I've considered trying to fix this, since the fabric is very nice and I do like the stripes, but in the meantime it lingers unworn. I made two blouses, a Josephine top and a Bess. My rayon challis Bess wins that contest hands down - it is deliciously light, flowy, and comfortable, and looks great tucked, untucked, under a cardigan or jacket, or on its own. I've worn it with jeans and dressed it up with a suit. The perfect garment! I need more of those too! In contrast, the Josephine feels rather square and boxy larger bust. Nonetheless, the fabric is very nice, and it looks good with a suit, so it did see some wear this past summer. I also made five skirts. Of these, my most frequently worn is definitely Liesl's Everyday Skirt. Another great pattern that has stood the test of time for me! It's comfortable (that elastic back is the best!) but polished enough for business casual days at work. The fabric I used was good quality and washes well, so that helps too. Sometimes simple really is best. My second favorite is the Mabel skirt. You just can't go wrong with knits! I made two dresses this year, an Alder Shirtdress and a Washi dress. I will confess, I rarely wear my Washi dress. It only looks good belted and it's just not very comfortable. It looked good in photographs, but I don't feel that it's very flattering in my everyday life. I know so many seamstresses love this pattern, but I think I've decided it's just not my thing. I made the Alder dress late in the year, so it hasn't seen a ton of wear, but I'm hoping that will be a go-to item when the weather warms up. I was very impressed with Grainline patterns generally and want to try more of them. In general, I have learned that I am more of a "separates" person. I just don't wear dresses very often, and when I do, I want them to be easy and relaxed. In 2014, I mostly sewed skirts and tops, which worked out well, because that's what I actually wear most days. While not every item here was an unqualified success, I learned a lot about what I enjoy wearing and the truth is, I probably wore at least two me-made items on an average week, which is a big increase for me. So that's great! For 2015: I want to continue sewing basic, comfortable, everyday garments for myself. While it would be great to learn to fit a party dress or tailor a suit or sew jeans, I don't know that this is in the cards for this season of my life. But I know I can expand my wardrobe a bit with some more very wearable and comfortable items. And my Nova Tote! I use that thing all the time! That was definitely a hit. I have a couple more in the works for gifts. Joe remains a tough nut to crack, and he disliked as many projects as he embraced this year. I find this pretty frustrating and upsetting so I honestly don't want to sew for him as much as I used to. That said, I made him a handful of things this year. At the beginning of the year, I made two pairs of Jacob pants for Joe. I loved this pattern, and especially, all of the potential for incorporating piping! Too bad Joe swore off pants entirely shortly after these were made and hasn't even considered wearing these since. Sigh. They are really cute. Similarly, even in knit, Joe took a dislike to the Sketchbook Shorts I made for him. Oddly, he was willing to tolerate the Sketchbook Shirt a bit more, but does not wear it often (and that shirt was so much work to make!). He wore it to my cousin's wedding, and that was the important thing. Moving on. The hits of 2014 were t-shirts and knit shorts. Joe wears all of his mama-made t-shirts frequently. I recently lengthened last year's green Field Trip Raglan and whipped up a new Field Trip raglan for him. I didn't get around to blogging the project (and it's pretty basic) but Joe wears these two shirts all the time. Joe loves his zig-zag Flashback tee and knit shorts, and even enjoys wearing them together! Another big surprise hit was Joe's Robot! He sleeps with every night! Major mom-score on that one. For 2015: Resign myself to the fact that t-shirts are Joe's thing even if I find them relatively boring to sew. Maybe try a henley or polo necked tee for kicks? Definitely let Joe pick out more fabrics. Joe has really fun taste. Maggie made out pretty well this year! I count eight tops, eight bottoms, and five dresses in addition to a swimsuit, backpack, bonnet, and undies! It's no secret that I love sewing for little Mags, even when all she'll wear is "PINK PINK PINK!" One of my resolutions last year was to sew up more of my stashed patterns, especially vintage and Oliver + s, and I did pretty well with that. I sewed a couple dresses from vintage patterns (here and here and here), and I tried a couple of Oliver + s patterns for the first time, including the Sunny Day Shorts, 2+2 Top and Skirt, the Playdate dress, the Class Picnic Shorts, and the Roller Skate Dress. 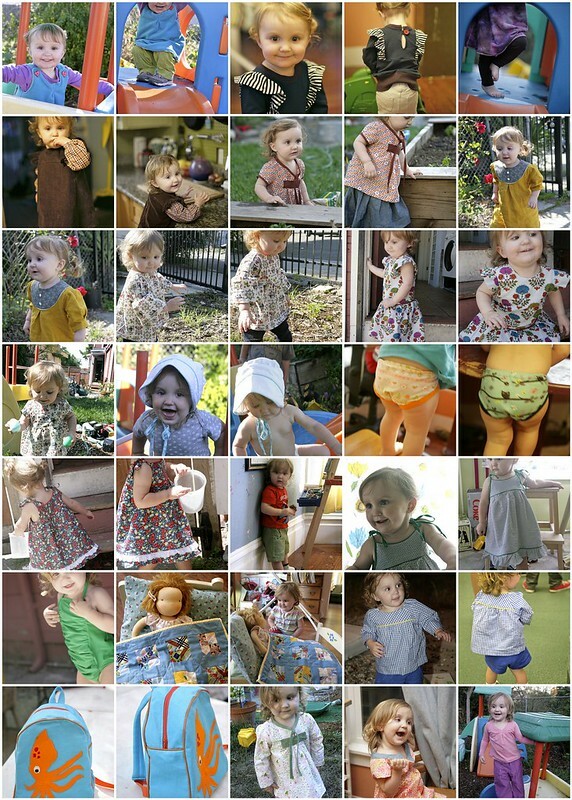 I also revisited some favorites, including the Sandbox Pants, Hopscotch Top, and Class Picnic Top. 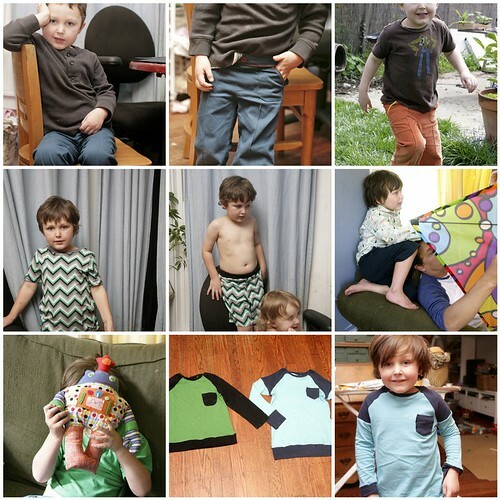 For 2015: I'd like to keep trying to sew through my Oliver + s stash this year. I already have some cool-weather plans for the Mags (pink culottes!). I have a feeling I will be sewing more Roller Skate Dresses, Playtime Leggings, and Class Picnic blouses this year - they are such easy pieces that Maggie loves to wear. I also have a couple of vintage patterns that I'd like to make this year. In general, I don't really need sewing goals for Maggie sewing - she's so fun to sew for, it just happens! 1. Sew down the fabric stash! It is currently out. of. control. 3. Sew more for the house. It's actually pretty fun! 4. Keep sewing for myself and expand my dressmaking skills. 5. Continue to work on my crochet skills. 6. Finish Maggie's quilt this year. I clearly need to incorporate some pink into it. 7. Finish my smocking/embroidery WIPs. 8. Have fun and don't get down on myself if I don't make as many things as I feel like I should! And with that, here's to a fantastic 2015! What are your sewing goals? Thank you Noelle! Yes, it's such a great pattern, isn't it? Doing this recap really made me think - I need more Plantains! Those two t-shirts are easily some of my most worn items. Wow Inder, that is a lot of beautiful sewing. I think sewing for Joe must be like sewing for my Twins. Sportswear features pretty heavily on their wish lists too. Have you tried freezer paper stencilling? That can make a dull project more fun. I love what you sew for Maggie, we have very similar tastes. That back pack is awesome! I love to see what you sew for yourself, we have similar body shapes and likes. I must try the Plaintain tee. Thank you for sharing your beautiful sewing with me. You have to try the Plantain! It's really one of my favorite patterns. And it's free! My only minor criticism is that 5/8" seam allowances on a knit t-shirt, esp. the neckline, is just weird. I can't serge a neckline on with that much excess fabric. So I trim it down to 1/4" then sew. Thanks for the tip, re seam allowance on the Plaintain. Hugo is considering doing Medicine so I want to make him some Caduceus printed tee's. I need to simplify one to make a freezer paper stencil. Your Toyota died at 110? Doesn't it know that its supposed to last at least until 220k?!? That's what we're banking on for my 1999 corolla (I love that little car). You have had a productive year (in so many ways!). I love hearing what's worked for people and wasn't hasn't (and why). You may have finally convinced me to try the moneta. When I first saw it I thought that there's no way I'm paying for a simple knit pencil skirt pattern but you may have convinced me otherwise. I blame you, Inder! And happy new year! Inder - you had an amazingly productive year! You're a working mom, you still nurse at night (or did), you have two small kids. But maybe all of those things are reasons we moms need to carve out a few hours to ourselves each week to work on things that truly energize us? I love reading your recap! Looking forward to seeing your makes in 2015. Do it!! And come visit me soon! Wow did you have a productive year! Awesome wraup-up! yay for the year end recap blog post. Look at it all! if the washi dress is the green one with the tie front, I can't get over how it makes your bosom look! I never thought I needed a Washi dress but wowser, I think it looks great on you! Here's hoping that by the time Maggie starts to care too much, Joe has come full circle and you can keep making such lovely things for the kids. It's been an awesome year of sewing. That is a great year of sewing! I loved reading your reflection and seeing all your creations again. And I just got my recap done now, so you're practically early in my book :) I love that blue color-blocked tshirt on Joe. Do you have the Rowan tee pattern? It looks to have a bunch of fun options that might spice up tshirt sewing! I'm hoping to give it a try soon. Happy New Year to you and yours! I'd say that's a very productive year of sewing. I am learning to find happiness in making plain basics for my big boys that I know will be worn to death - boring, boring dark-coloured shorts at the moment! But at least I can make sure it's great fabric with a bit of topstitching and stuff. I'm pleased they haven't started refusing all handmades - I'll take what I can get! On economic recovery and the apple-picking dress.